Marcel Broodthaers, The Rain (Draft for a Text), 1969, 16 mm, black-and-white, silent, 2 minutes. Even as the Great Powers divvied up Europe following World War II, some artists dared to envision a single unified continent. “From now on we must consider all of Europe,” declared one collective of Hungarian artists and writers in 1945. “The New Europe could be . . . a synthesis of East and West.” Their manifesto might as well be the mission statement of this exhibition, a survey of nearly two hundred artworks by approximately 150 artists representing Russia and eighteen European countries. Debunking the simplistic East–West dichotomy through which postwar art is regularly understood, the show presents works by artists on both sides of the Berlin Wall that address common issues including consumerism, technology, space travel, uprisings, and atrocities. Didactic realism, for instance, was hardly limited to Eastern Europe. Pablo Picasso’s Massacre in Korea, 1951, depicts faceless robot soldiers gunning down women and children with the same heavy-handedness found in the Hungarian painter László Lakner’s portrayal of two doomed rebels, Execution of Revolutionaries, 1965. The most compelling works convey both loss and the potential for radical reinvention. 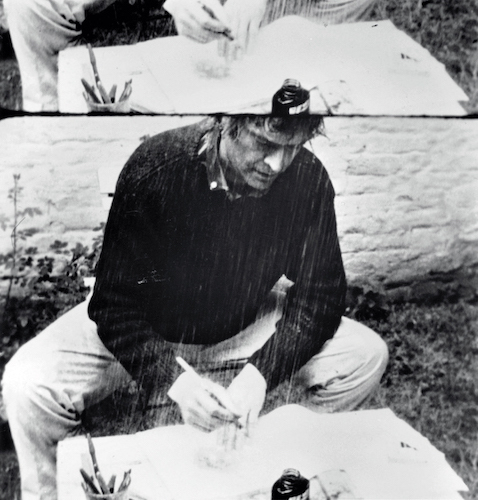 In the short silent film The Rain (Draft for a Text), 1969, Marcel Broodthaers attempts to write in the middle of a torrential downpour. He doggedly loads his fountain pen with ink, only to have his words instantly washed off the sodden page. Five delicate paintings from Russian artist Francisco Infante-Arana’s 1965 “Starry Sky Reconstruction” series depict stars arranged in new geometric constellations that suggest humanity’s ability to create fresh meaning. The twin currents of devastation and reinvention come together in Belgian artist Paul van Hoeydonck’s Spacescape, 1961, a wall-mounted sculpture where shards of marble and small nails are strewn across a white ground, evoking the wreckage of Western civilization. The title, however, shifts our focus from the past to the future, from our own planet to a new frontier.